I was pretty hacked off that two supermarkets and three health food stores between them couldn't muster a bag of buckwheat flour, but consoled myself with vast quantities of crepes. 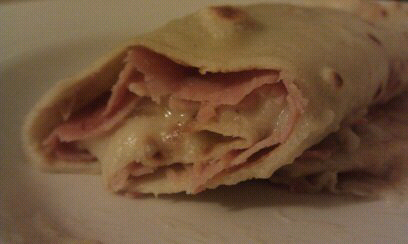 And you can't beat a classic ham-based filling for a crepe. Easy really: make a bechemel sauce, saute an onion and some sliced mushrooms, grate some gruyere, and add the cheese, onions and 'shrooms to the sauce. Make the crepes, keep them warm, put two thin slices of ham on each and smear liberally with the sauce. Then whack them in a hot oven for a few minutes.